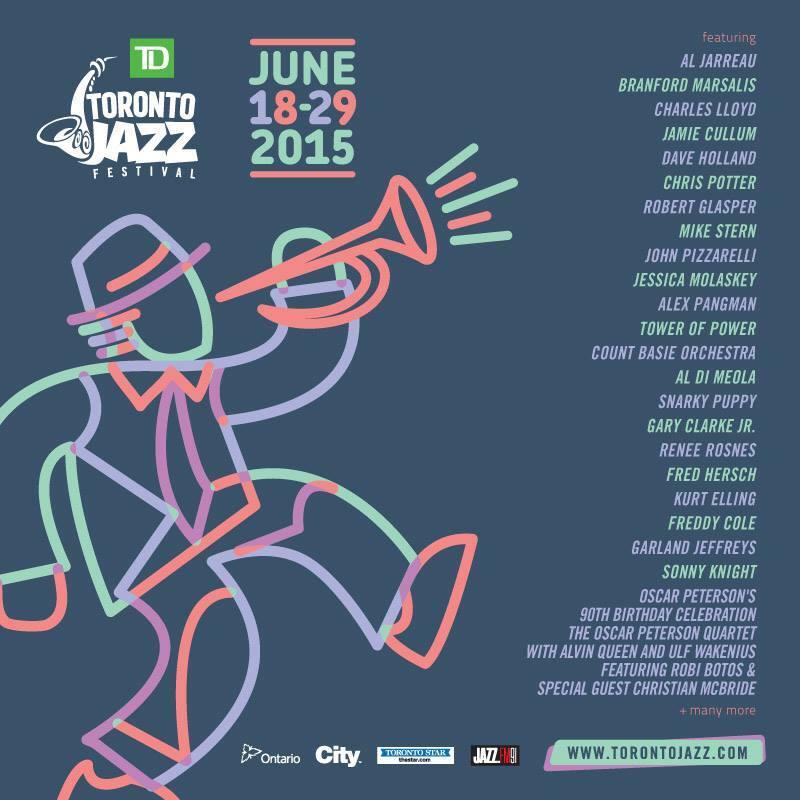 The 29th edition of the TD Toronto Jazz Festival 2015 lineup gets underway this summer as over half a million jazz music fans will come together at over 50 Toronto locations to experience one of the city’s largest music festivals. From June 18 – June 29, over 1, 500 musicians will entertain audiences and start the summer right. Oscar Peterson 90th Birthday Celebration: The Oscar Peterson Quartet with Alvin Queen and Ulf Wakenius featuring Robi Botos & special guest Christian McBride – Jane Mallett Theatre at 8 p.m.
Renee Rosnes Quartet – Jazz Bistro at 8:00 p.m.
Heather Bambrick & Friends – Home Smith Bar at The Old Mill at 7:30 p.m.
Tower of Power – Nathan Phillips Square at 8:30 p.m.
Renee Rosnes Quartet – Jazz Bistro at 8:00 p.m. / 10:30 p.m. 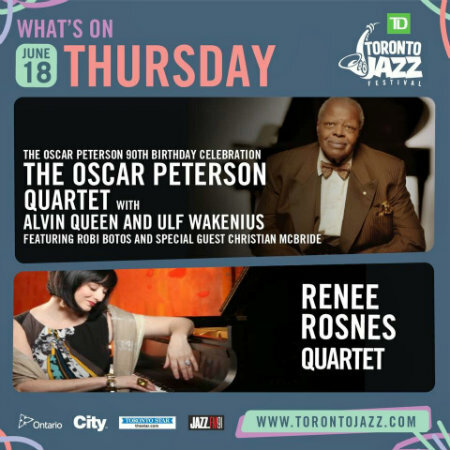 The Legendary Count Basie Orchestra, directed by Scotty Barnhart with guest vocalist Carmen Bradford – Nathan Phillips Square at 8:30 p.m.
Fred Hersch Trio – Jazz Bistro at 8:00 p.m.
Al Jarreau – Nathan Phillips Square at 8:30 p.m.
Drew Jurecka’s Gypsy Swing Quartet – Jazz Bistro at 8:00 p.m.
Mike Stern Trio – Horseshoe Tavern at 10:00 p.m.
Christian McBride Big Band – Nathan Phillips Square at 8:30 p.m.
Robert Glasper Trio – Jane Mallett Theatre at 8:00 p.m.
Phil Dwyer Trio – Jazz Bistro at 8:00 p.m.
*Kurt Elling – Koerner Hall at 8:00p.m. 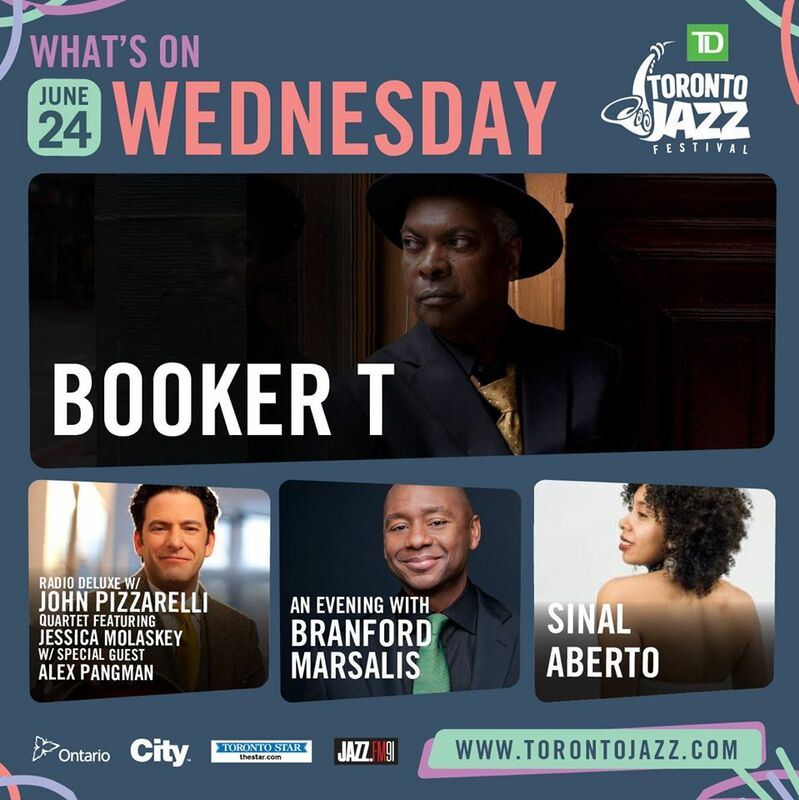 An Evening with Branford Marsalis – Jane Mallet Theatre at 8:00 p.m.
Booker T – Nathan Phillips Square at 8:30 p.m.
Sinal Aberto – Jazz Bistro at 8:00 p.m.
*Radio Deluxe with John Pizzarelli Quartet featuring Jessica Molaskey with special guest Alex Pangman – Koerner Hall at 8:00 p.m.
Dave Holland, Lionel Loueke, Chris Potter & Eric Harland Quartet – Jane Mallett Theatre at 8:00 p.m.
Duchess – Jazz Bistro at 8:00 p.m.
Garland Jeffreys – Horseshoe Tavern at 10:00 p.m.
Snarky Puppy – Nathan Phillips Square at 8:30 p.m.
Charles Lloyd featuring Gerald Clayton, Joe Sanders & Kendrick Scott – Jane Mallett Theatre at 8:00 p.m.
Jackie Richardson & Friends – Home Smith Bar at The Old Mill at 7:30 p.m.
Freddy Cole Quartet – Jazz Bistro at 8:00 p.m. / 10:30 p.m.
Sonny Knight & The Lakers – Horseshoe Tavern at 10:00 p.m.
Gary Clark Jr. – Nathan Phillips Square at 8:30 p.m.
*Jamie Cullum – Koerner Hall at 8:00 p.m.
*All artists marked with an asterisk indicate previously announced shows. For detailed festival listings, club shows and more, visit torontojazz.com.